When people who don't know our family see me with Ben, they sometimes tell me to enjoy his toddlerhood because the years fly by. Oh, I know. Some days, I can't believe I have two teens. And yet, the early years with Max actually didn't zoom by—they seemed to pass in slow motion, because I was so focused on the lack of progress. I was thinking about this because I cleaned out Max's closet last week and found his old Lightning McQueen sneakers. Although I didn’t remember saving them for posterity, I did recall mourning that he was about to outgrow them when he turned 11. There they were, glorious red relics of his McQueen phase. Almost worthy of The Smithsonian. It didn't seem that long ago that he was loving them. When you have a child with disabilities, the infancy and toddler years can be particularly anxiety-ridden. You are acutely aware that your child likely won't hit the typical milestones on time, but you can't stop yourself from wondering when they will happen...if ever. When would he sit, unsupported? When would he be able to crawl? Pull to stand? Take a step? Babble? Pick up a toy? Color with a crayon? Understand letters and numbers? Form words? Form sentences? Toilet train? When you're so focused on reaching a goal, the journey there may seem to take forever, especially when doctors have told you dire things about your child. Would he? Would he? Would he? Would he? 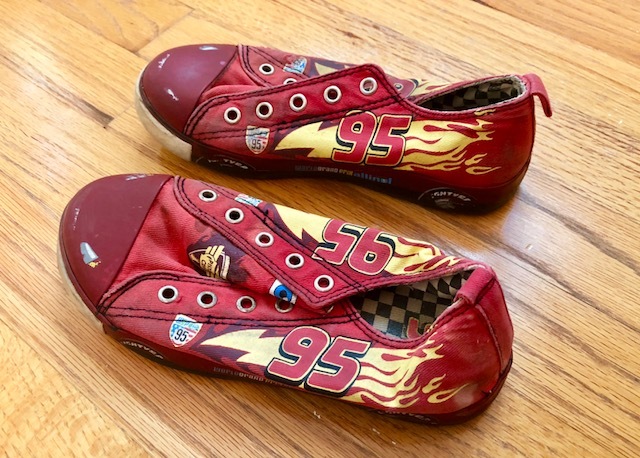 And then, suddenly, you have a 15-year-old and one day you find his Lightning McQueen sneakers in the closet and it won't seem all that long ago that he was going through his Cars 2 obsession. Or his car wash phase. Or his purple phase. Or the spaghetti one. Or any of them. It won't feel that long ago that he was zooming around your house in his walker on wheels or taking to the street in the last walker he had before he took his first steps alone. You can still vividly picture him in his room, tentatively leaving your arms to totter into your husband's, at age 3. You will remember his fascination with chocolate pudding, pushing him on the swing in the park and the glee on his face, when he learned to say "Ohmmmy," the way he looked in his velvet blue sailor suit someone got him as a gift when he was born and how the craniosacral therapist you took him to see at age two months old held him in her arms and called him a "little package" because he was so chubby-sweet. So many memories will flood your head as you sit there on the floor of your child's room, holding those sneakers close to your chest and feeling all the feels. And you will be sad that his childhood passed so fast, even though you know very well it felt like just the opposite at the time. But now he is bona fide teen with all that teen spirit and 'tude and you wouldn't be surprised if he returned from camp as tall as you are. And while you know there is nothing that could have prevented all that anxiety and worry back then, you will wish that you could go back to your younger mother self and tell her to cherish the time. And maybe that would have sounded like crazy talk to you then because as adorable as your child may have been, the freakouts about the future and the juggling of the therapies and the medical appointments and dealing with the sensory meltdowns and battling the insurance company and the sadness and the grief and the why-him and the why-us hardly seemed like anything to cherish. But I would tell my younger mother self—and I am telling you—to find a way to cherish and adore. To block all the worries out of your head when you're playing with your child or enjoying a walk or doing whatever family thing. To try so hard, as much as you can, to appreciate the beautiful child in front of you. To forget about what he or she isn't. To cnsider what he or she is. I can't tell you what the future will hold or what your child will be capable of or answer any of those whens, but I'll bet that someday you will be going through your grown child's closet and you will find an old pair of sneakers or an old sweatshirt or an old toy he used for therapy, and you will desperately wish you had cherished more. I * vividly * remember sitting in my car listening to a radio interview with Billy Ray and Miley Cyrus talking about their NEW SHOW HANNAH MONTANA. At the time Ms. 10 (has down syndrome) was still obsessed with Barney and I was wishing so hard for her to move on and enjoy more age appropriate shows. She had so much trouble connecting with peers when she would sing Barney in the playground. Ha! Both Max and Sabrina went through a Hanna Montana phase as well, along with iCarly. Similarly glad they are done! This is such a good reminder to stop and smell the roses because it is so easy to let the time slip away while I obsess over college or homework or my apartment being messy. I’m going to try to remember not to waste precious time as I head to the next school year. Thanks for the reminder!